Join us for an evening of musical entertainment, handmade bowls, and soup to raise money for the Soroptimist's Bunches of Lunches program. Congratulations to Junction City High School senior, Gabe Bagley! Gabe was presented with Oregon State University's most prestigious award, the Presidential Scholarship. The Presidential Scholarship rewards academic excellence and inspires recipients to continue to be a positive force in the world. Gabe plans to major in engineering. Well done Gabe!! Click Here to be Added to the Superintendents Newsletter Distribution List. Spring is (finally!) here and our schools have been buzzing with activity, excitement, and learning. We have so much we want to accomplish and celebrate before the end of the school year, so it will surely be a very busy couple of months. News from the March 18th board meeting can be found near the end of this update, but given that the prior (February) board meeting was just held on March 4th, the report will be a bit more brief than usual. On March 1st, after digging ourselves out of the snow, students and staff participated in an assembly and a 30-minute school-wide read-a-thon in honor of Dr. Seuss’s birthday and Read-Across-America. Students in pairs of olders and youngers selected Dr. Seuss books to read to each other. This year students read more than 500 books! This was such a fun way to celebrate Dr. Seuss, the love of reading, and get back into our school routine after four snow days! A big thank you to Kindergarten teacher, Pam Nelson for organizing the event! Students and teachers returned from the unexpected weather break renewed and ready to engage in learning. Preschoolers worked on STEM projects designed to catch leprechauns, Kindergarten students were busy writing research papers regarding the Iditarod, fifth grade hosted a Pi challenge- where staff and students alike where challenged to memorize a pi fact or as many of this irregular number’s digits as they could. These were just a few of the engaging and deep learning opportunities happening at TES in March. School wide, we’re making attendance a priority. We recognize that improving attendance requires a team approach. As a staff we have stressed the importance of making learning engaging, meaningful, and directly tied to the priority standards. We’ve shared with parents the significance of good attendance in relation to their student’s academic success. As such we have asked parents to make school a priority, scheduling trips during breaks, and setting routines in place that help with attendance. Furthermore, Principal Sisler recently visited each classroom and enlisted students in the work of improve school attendance. She discussed what students like about school, why school is so important, and what they can do as part of the team to improve their attendance. We have already heard positive feedback from parents regarding improved attitudes and urgency to get to school. Go Team Territorial! Additionally, on March 13th, representatives of the Junction City Soroptimist Club visited Territorial to give each and every child their very own book again this year. It is such fun to see the excitement generated by this activity as students select a book to KEEP. Many thanks to the members of the Junction City Soroptimists; we appreciate their continued efforts to support our students and families throughout the year. Speaking of reading, we want to recognize the hard work that TES OBOB participants put into preparing for the district OBOB competition. Two teams advanced to regionals, and although they did not qualify to move on to the State competition, they did an amazing job! They were knowledgeable in the 16 book titles and showed great sportsmanship. We would also like to thank their amazing coach Wendy Thelander for her hard work and dedication. Staff used time on March 15th to complete 2nd trimester report cards and plan for instruction through the end of the year. Additionally, students busily prepared for the annual Project Fair and Talent Show which was held on March 21st. We would also like to mention that our annual kindergarten registration is taking place every school day from April through June from 7:30 AM to 3:00 PM. We have registration packets to pick up and fill out in the office. We will have our Meet and Greet on Thursday, April 25th from 2:45-3:45PM for students to meet their teacher and pick up and or return the registration packets. This is also a great opportunity to learn more about KITS, the Kids in Transition to School program. KITS is an evidence-based school readiness program developed at the Oregon Social Learning Center. The program provides a boost to children’s literacy, self-regulation, and social skills just prior to kindergarten via a system of positive teaching and behavior change strategies. It also provides parents with tools and skills to teach and advocate for their children. We are pleased to share that Junction City School District will once again be hosting this program. During the month of March, we also had the opportunity to honor our classified staff. Their dedication and contributions to our school and students is indispensable. We value the work that they do, and the immeasurable difference that they make for our students. TES would like to thank the classified staff for their kind hearts, warm smiles, and daily efforts that go above and beyond expectations. Our Laurel Vision focus for the Month of March is “Academic Growth”-this is prime time for us to be talking about personal belief in one’s ability to grow and succeed. We teach kids that they can get smart with effective effort and perseverance. Our brain and intelligence are so malleable, and with high levels of learning, we can all achieve our goals and experience excellence. It is important for us to communicate to children that mistakes are proof that we are learning and growing; and failure provides an opportunity for learning and growth. We want to foster strong, confidant learners who are willing to take risk and who are not afraid to try new things. Laurel’s third and fourth grade students are getting ready to take the Smarter Balanced tests. Our teachers are preparing to start administering the practice test after Spring Break to allow students to get a feel of what it’s like to take the test. The actual testing period is going to start in May. We hope to conclude testing in both reading and math in a period of 3 weeks. The OBOB teams that represented Junction City School district were all rock stars. There were 57 teams that competed in the 3-5 grade Regional Battles held at Thurston High School. Laurel had a total of 5 teams participating this year. Both Laurel and Oaklea teams made it to the Sweet 16 in the afternoon. All team members, parents and coaches showed awesome sportsmanship. The teams were proud to represent the hard work of the many students that have been involved with OBOB this year. A huge thanks to the Chintimini Foundation for providing the financial support for this program. Please help me congratulate all OBOB team members. Just before Spring Break, we celebrated the retirement of one outstanding staff member and a staple of our Laurel community. Carla Allen has decided to start a new journey, and while it will be a great loss for Laurel, we are so excited for her to go on her new life adventure. The Laurel staff, student and community will always remember the positive impact she has had- her dedication and service will be unforgettable. Thanks to the Laurel Parent Group for gifting us with approximately $5,600; these funds were used to purchase and install new mats to cover the climbing wall! These mats replaced the very old and overused mats and will be more sanitary and will more safely block off the rock wall when it is not a planned activity. We are grateful for the generosity and leadership of our Parent Group, and we thank them for their continued support. Despite the snow and the cancellation of our Dr. Seuss Family Fun Night, the Soroptimist Group of Junction City came to Laurel after our snow days and celebrated with all of our students by gifting a book to each and every one of them. The students treasured those books and were so happy to receive them. We are grateful for this valuable gift, and we appreciate this wonderful effort to instill the love of reading and learning. March has been a busy month at Oaklea. Ms. Liechty held a fantastic band and choir concert on March 7th. To quote one visitor “the pieces chosen were a great mix of songs that are interesting for kids and others that are great for musical knowledge- and yet the kids were engaged and interested in ALL pieces, not just the “fun” ones.” Hats off to Ms. Liechty and the band/choir students for another amazing performance. We had our annual 8th grade boys vs. girls’ basketball game on the 11th. The fun wasn’t limited to just the players and the basketball game. For additional fun, a half-time dodgeball game was added that put the two teams against their siblings and parents. This event is always a ton of fun and well attended. Oaklea’s track practice has begun and the track team hosted their parent information night on March 7th. Track currently has over 100 participants! To quote Coach Starr, “Woo Hoo!” The Oaklea track team consistently offers a positive and fun opportunity for so many students year in and year out. On Saturday, March 16th Oaklea hosted both the middle and high school OBOB regionals- more than 300 students were in attendance. This is a major event and would not be possible if not for the direction and organization of our very own Mrs. Johnson. Oaklea’s Team J2EK took 12th place and lost in the sweet 16 by only 2 points to Roosevelt Middle School, who ended up 2nd. On March 4th, a few Oaklea staff members joined staff from the other Junction City schools to again visit the White River School District. These opportunities allow for more staff to see the power of (Professional Learning Communities) PLCs in real time by an institution that has been using this process for a number of years. Our staff came back with new ideas, beliefs, and connections. We’ve already been able to reach out to the White River district for access to a number of instructional tools and assistance that has reinforced the work we have completed so far. Oaklea’s Team Leads will again attend training with White River’s Superintendent on March 21st and 22nd. Given the need to use the March professional development day for some snow make up time, these two training days will allow our PLC work to maintain traction and plan for both the upcoming months and into next school year. Staff from Oaklea and the district also attended a Title IX investigation workshop in Portland on March 11th. This workshop was presented by The Hungerford law firm and though we hope it is never needed, the information shared is critical to ensuring we are following the law in relation to Title IX. Leading up to Spring Break, classes were busy wrapping up trimester two with projects, papers, and finals in some classes. Mrs. Johnson’s 7th grade science classes built DNA using colored pop beads. They manipulated its structure with their hands to determine locations of the components and why it is called a double helix. A lab that allowed them to extract and precipitate their own DNA out of solution followed. This lab started with a one-minute swishing of Gatorade- that according to Mrs. Johnson is the quietest you will ever see a 7th grade classroom. This super engaging and fun lesson is a favorite of the 7th graders. Mr. Davis’s elective class helped Pennies for Patients with announcements and posters. The event raised approximately $1,600 in the end, which was all student driven. Oaklea staff have so many fantastic lessons planned for the final trimester of the year, along with a number of exciting trips and excursions for our students. Spring break will be a nice opportunity for everyone to recharge their batteries, spend some family time, and prepare for the final chapter of this school year. It’s going to be great spring and we are pumped for the work that has been taking place and the direction that our building is headed. As always, we appreciate and sincerely thank everyone who has helped and continues to help our students in this community. Both of our JCHS Robotics teams qualified for the State Tournament, and student representative to the board, Emma Mote, spoke more about their outstanding finishes to the season when she gave her high school report. Our Chess team also finished their competitive season at State this month. Track & Field season has begun, and the student-athletes are definitely enjoying the brand new track. The tennis team already has had three match victories vs Hidden Valley, North Bend, and Marshfield, and the golf team will begin its competition season shortly. Our Baseball and Softball teams both look to be in the running for State titles this season, returning many players from last spring's successful teams, so lots of great Tiger Sports to celebrate this season! This month, we are preparing for our Accreditation Team visit with Advanced Ed on April 9th and 10th. Part of the requirement is submitting survey data from parents, students, and staff. Collecting this information has been informative, and will help us improve our current systems and programs. Following spring break, we will begin forecasting for the 2019-20 school year, having students select courses and visiting with our 8th graders and parents in preparation for high school as well. We also will soon be reviewing our High School Success Plan and developing a budget and program supports for M98 for the 2019-21 biennium. On March 13th, we welcomed in students and parents for our Latino Family Night. We would like to thank our District’s Bilingual Resource Specialist Daniel Pozos for organizing this special event, and for networking with community groups and local student support agencies to prepare all our students for a variety of great post-secondary options. 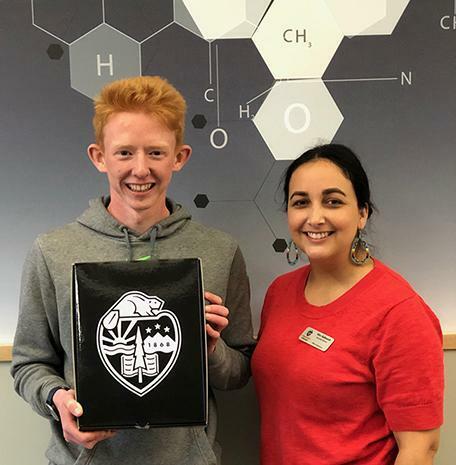 Finally, we would like to congratulate Junction City High School senior Gabe Bagley for being selected to receive the prestigious Oregon State University Presidential Scholarship. This is a $40,000 scholarship, and a tribute to Gabe's hard work and dedication throughout high school. On Monday, March 11th, District and JCHS staff welcomed in community members, parents, and alumni to our Open House tour of the new building and remodeled areas. Cheerleaders welcomed guests at the new entryway, and teachers, administrators, district staff, and our DeChase-Miksis and DLR partners guided excited patrons through the building. It was a wonderful night to say "thank you" to our community for providing us with a state-of-the art-learning environment that will be enjoyed for decades to come. Copies of the fliers from the tour are on the back table, and have been shared at a recent Soroptimist meeting- Brian will share some at an upcoming Chamber meeting soon, and will be attached to this March District Update as well. In addition to showing the key features that were highlighted during the tour, the reverse side of the flier provides a great overview of the funding sources we leveraged for our facilities improvement projects. It is really important to thank our community for passing the $14.6M bond in May of 2016, and to remind them that through grants and other funding sources, we were able to leverage an additional $11M for facilities improvements that our taxpayers will not have to pay back. I’ve been spending a lot of time in Salem as part of my work on COSA’s Superintendents’ Board of Directors, and every Friday morning I have a “legislative update” conference call with COSA and OSBA lobbyists as well as other members of the COSA board. While we often discuss the progress of various bills- such as the Senate’s draft PERS work-back bill- we also talk about the legislature’s budget plan for the upcoming biennium. We have also seen the recently released Co-Chairs budget framework upon which our 2019-20 budget will be based, but I also would like to share with you some advocacy efforts that we are involved in relative to promoting the concept of a School Improvement Fund. As I’ve shared previously, the School Improvement Fund would provide at least a $1B investment in K-12 in the 2019-21 biennium and beyond. It is based on some of the foundational work from the Quality Education Model, and more recently the work of the legislature’s Joint Committee on Student Success. As currently conceptualized, the funding would be targeted in 4 general areas- reducing class sizes, providing more learning time, supporting students’ health and safety needs and ensuring a well-rounded education. A few weeks ago, I reached out to our staff to get their input on how they would envision our district using these investment funds to provide a higher-quality education for Junction City students. I received over 100 responses to my survey! Those responses are available for your review, and helped to form the basis for our District’s Funding Advocacy poster that shows how our district might use such School Improvement Funds. I plan to share these with our local legislators when they visit JCSD in early April to tour our new HS addition- please let me know if you have questions and let Stephanie know if you would like more copies. At their March 18th meeting, the board jumped right into action items, first approving minutes from the meeting held two weeks prior and then approving the resignation of two staff members-temporary music teacher at Laurel Elementary, Marcia Moores, and OMS classroom teacher Pauline Gibson-Tobin. The board also approved a limited number of inter-district transfer openings at each school for the 2019-20 school year; as noted previously, the prior “Open Enrollment” process is no longer authorized by the Legislature, so districts will be reverting back to the transfer process in the event that students wish to move between districts. More restrictions are in place on the transfer process, including the requirement that the transfer be approved by both the resident and receiving districts. The board then moved on to the Discussion Items, first hearing the Junction City High School Annual Report, delivered by JCHS Co-Principals Dina Marschall and Brian Young. Materials related to their presentation will be attached to the official minutes for the board meeting; the official minutes are housed at the District Office. Next, there was a discussion about inclement weather make-up days, since we had two more late starts since the March 4th board meeting. The district’s updated instructional hours were reviewed with the with the board and it was determined that we were 2 hours below the state required minimum at the 9th-11th grade levels. Consequently, the board approved my recommendation that they count up to 4 hours of professional development time- as allowed by state statute- to meet the hour requirements. It was noted that if there are any further instructional days lost before the end of the school year due to inclement weather, emergencies or other unforeseen circumstances, the board might then act to add days to the end of the school year. Before adjourning for the evening, the board engaged in a fulsome discussion of the District’s “Materials Distribution” policy and practices. They affirmed the practice of having buildings make materials available in their front offices, and making students and their parents aware of the availability of materials from non-profit entities that serve children by announcing those in school newsletters and in student announcements. The final items for the evening included discussion of the monthly financial updates and student enrollment for the month of March. Our March enrollment is up 4 students from last month, and down only 7 students from the beginning of the year. With the proposed development of the land west of Oaklea between 6th and 10th, our District’s future enrollment concerns may likely be related to crowding and capacity at our schools. The board’s next meeting is scheduled for Monday, April 22nd at 6 PM. Until then, GO TIGERS!